Beauty sleep is overrated—why not stay just out late having fun and let your toiletry bag take care of the rest instead? When you shop online with a free Superdrug voucher code you’ll be able to pick up every lotion and potion under the sun, as well as some brilliant savings to be had across their range of bathroom essentials with Superdrug vouchers and 3 for 2 savings galore! The UK’s second largest beauty and health retailer, Superdrug was originally founded in 1964 and they have since grown their brand to become a trusted high street name offering beauty, health, skincare and perfume at affordable prices. As well as providing customers with all their favourite toiletry brand names, Superdrug also designed their very own line of products which covers everything from fabric plasters to fake tan. In addition to their extensive range, Superdrug also aim to support their customers with an online doctor service—allowing you to search advice and support for sensitive topics which you may not feel comfortable discussing with your own GP in person; as well as a number of pharmaceuticals such as pregnancy tests and other medicines delivered straight to your door. Stock up your bathroom cabinet today and make a great saving on everything from shampoo to shaving cream when you shop online using a free Superdrug promotion code from our website—be sure to have yourself a well-earned night of pampering this weekend, and perhaps at least one early night too! 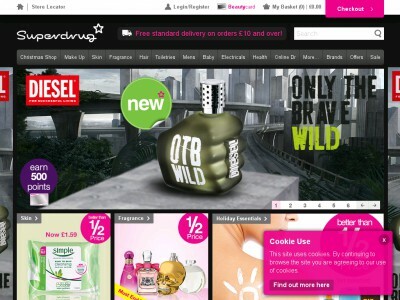 Superdrug is a UK-based company which is part of the A.S. Watson Group. Their managing director is Dominic Lai and their two Distribution Centres are in Pontefract and Dunstable. The company has over 850 stores across the country which also includes Ireland since 2006. They employ over 12000 people. In over 220 of their stores you will find pharmacies and pharmacy consultation rooms. The Pre-Tax Profit for Superdrug in 2013 was £29 million. Stop by our website to pick up your free Superdrug voucher code and then click over to the Superdrug homepage to begin browsing. If you already know exactly what you’re searching for then use the labelled tabs to locate the relevant department, or get inspired by their slideshows for tips and ideas on the latest beauty tips and tricks. Once you’ve located your favourite items, simply add them to you shopping basket and then review this at any point as you shop by clicking on the icon at the top right hand side of the screen. When you are ready to continue to the checkout, you will be able to locate the “Coupon Code” box to the left hand side of your page, where you can enter your Superdrug promotion code then click “Enter Code”. The discount will be automatically applied and your total price updated. After entering your personal information and payment details your order will be confirmed and soon on its way out to you from Superdrug, enjoy fresh health care and beauty tools all at a great price too! From deodorant to dilapidation cream, whatever kinds of toiletries you love to use each day, when using a Superdrug voucher code to purchase from their expansive selection you will be able to completely re-stock your bathroom cabinet for less than ever before! Explore their huge range of own brand products or take a look at the Brand Directory for yourself by visiting Superdrug online today, and make sure to treat yourself to all kinds of new additions when you shop online using a free Superdrug promotion code from our website! couporando.co.uk offers always fresh Chemist Direct vouchers. If not, visit Beauty & Health category and choose another nice rabate for stores such as Fragrance Direct, Lloyds Pharmacy . Seek inspiration with a flick through their carefully curated latest deals on the Superdrug homepage, then go on to choose your favourite products from the range. Click on the item’s photo to be taken to a more detailed page where you can see further details about the ingredients and uses of the product. If you’ve decided this is the product for you, then simply “Add to Basket”, or continue shopping for further additions to your bathroom shelves. If you have a Superdrug voucher code locate the “Coupon Code” box to the left hand side of your page, where you can enter your Superdrug promotion code then click “Enter Code”. The discount will be automatically applied and your total price updated. If you wish to, create a user account with Superdrug to make shopping next time even faster and more convenient. You can also choose to checkout as a guest if you prefer. Allow their collection do the rest by clicking over to their website to get started with their online shop. Just remember to collect your free Superdrug vouchers from us before you arrive! Standard Delivery (3-5 working days) = £3 or FREE on all orders placed over £10! Order and Collect in Store (within 5 working days) = FREE! 1. Check that it is at least 28 days since your item was dispatched, for sale items this may differ. 4. Receive a full refund from Superdrug within no time at all! Be sure to keep them in your newsfeed, and share the latest updates with friends as soon as a new Superdrug voucher code becomes available! Buy now online at www.superdrug.com. Whether it's hair dye for a last minute new look, emergency tights or new mascara, Superdrug is always on my list when I head to town. That's why I was delighted to discover the money I could save with Superdrug vouchers. By just visiting superdrug.com and entering my Superdrug voucher code I got all my regular essentials for a great price. You can use a Superdrug promotion code to get fantastic deals on everything from make up and skin care to baby products and electrical items. Now I recommend using Superdrug codes to all my friends!